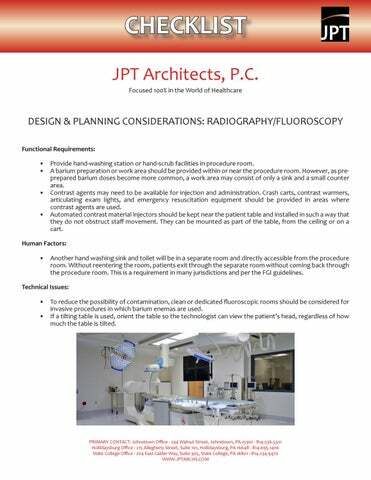 DESIGN & PLANNING CONSIDERATIONS: RADIOGRAPHY/FLUOROSCOPY Functional Requirements: •	Provide hand-washing station or hand-scrub facilities in procedure room. •	A barium preparation or work area should be provided within or near the procedure room. However, as preprepared barium doses become more common, a work area may consist of only a sink and a small counter area. •	Contrast agents may need to be available for injection and administration. Crash carts, contrast warmers, articulating exam lights, and emergency resuscitation equipment should be provided in areas where contrast agents are used. •	Automated contrast material injectors should be kept near the patient table and installed in such a way that they do not obstruct staff movement. They can be mounted as part of the table, from the ceiling or on a cart. Human Factors: •	Another hand washing sink and toilet will be in a separate room and directly accessible from the procedure room. Without reentering the room, patients exit through the separate room without coming back through the procedure room. 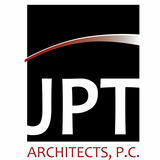 This is a requirement in many jurisdictions and per the FGI guidelines. Technical Issues: •	To reduce the possibility of contamination, clean or dedicated fluoroscopic rooms should be considered for invasive procedures in which barium enemas are used. •	If a tilting table is used, orient the table so the technologist can view the patient’s head, regardless of how much the table is tilted.